bliss's genre consolidation rule is a powerful way of getting a handle on an out-of-control computer audio genre list. 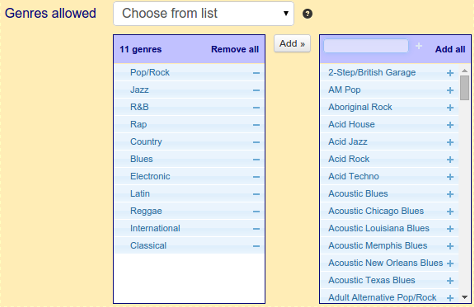 bliss has a set of default genres from which you can choose, but what if you want to add your own that isn't in the list? I received an email the other day asking how to add custom genres. 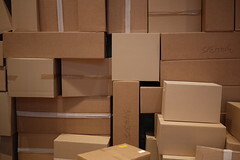 I appreciate it's not 100% obvious how to do this at the moment... but still, the ability is there. 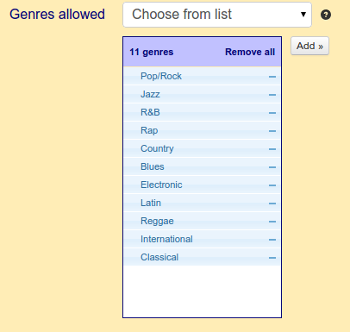 A custom genre can be added to the "allowed" list by typing in the name of the genre in the search field and then clicking the "+" plus button. That text field at the top of the list is a search filter. 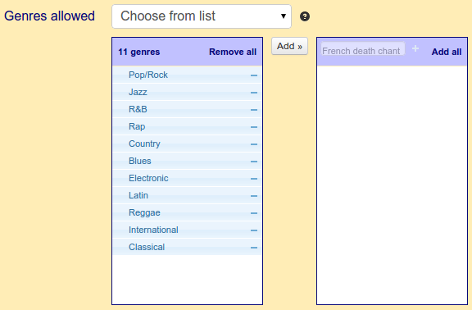 If you type your genre in there, the list will filter. Then, the usual click of Apply rules and bliss will begin assessing your genres, including making sure all those French Death Chant albums are now nice-and-compliant! Thanks to fudj for the image above.